Students will be able to summarize nonfiction texts about U.S. rivers. Students will be able to ask and answer inference questions about nonfiction texts. Ask students if they've ever played or watched the game of jeopardy. Allow a student to explain the game to the class. Tell students that you'd like to play a class game of jeopardy. But first, they are going to learn about some American rivers and help you create the game. Ask your class to share what they already know about American rivers. Remind students that a RiverIs a moving body of water, usually freshwater, flowing towards an ocean, sea, lake, or another river. Sometimes, though, the river flows into the ground because it dries out before reaching another body of water. The start of the river is called a Source, and the end of the river is called a Mouth. Draw a picture of a river on the board, including the source and the mouth, and add labels. Draw another river flowing into this river. Tell students that the river flowing into another river is called a Tributary. Label it. 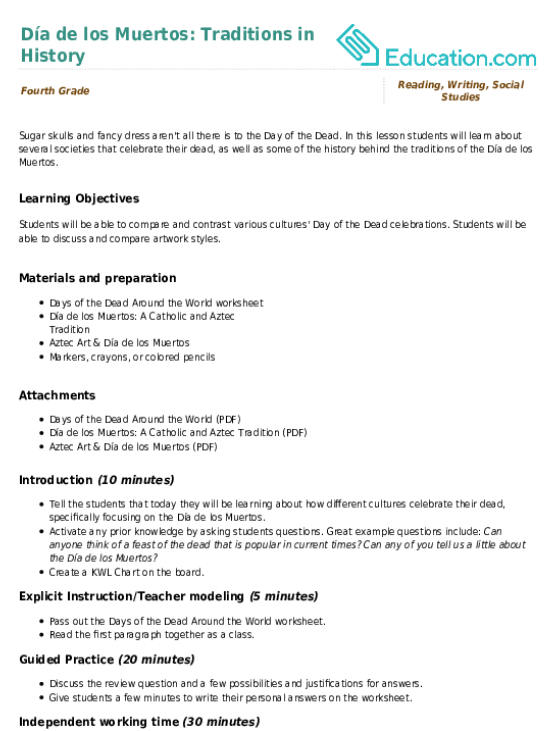 Continue to add labels to your diagram and give students the definitions. A river BankIs the land around the edges of the river. A river BedIs the bottom of the river. 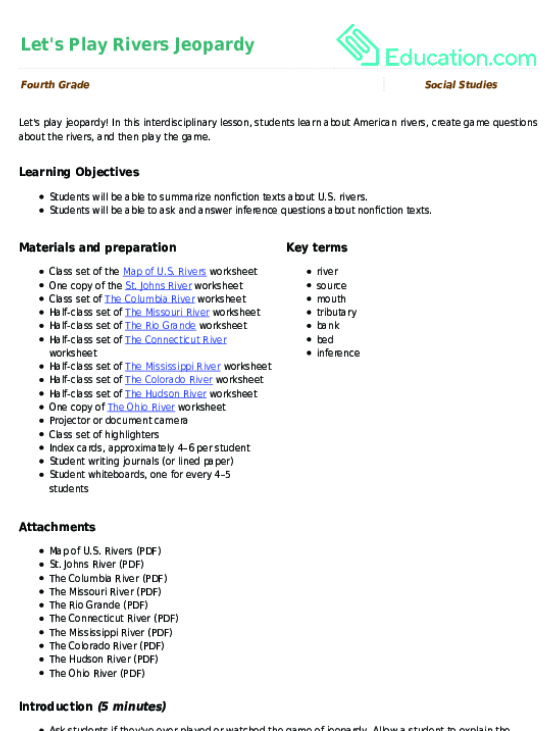 Hand out a copy of the Map of U.S. Rivers worksheet to each student. Project the St. Johns River worksheet onto the board. Tell students you are looking for the three most important details about the St. Johns River. Read the text aloud, stopping to highlight important details, such as, "The St. Johns River is the longest river in Florida." Explain to students that this is an important detail because it helps you understand where the river is located. Choose a sentence that isn't as important and explain to students the reason you didn't highlight it. Instruct students to find the St. Johns River on the Map of U.S. Rivers worksheet and label it. Remind students that an InferenceHappens when we figure something out even though it wasn't directly stated. Review a few real life examples with your class. Project The Columbia River worksheet on the board and hand one out to each student. Ask a student to read the text out loud. Afterwards, have students find and label the river on their Map of U.S. Rivers worksheet. Call on volunteers to share (up to three) facts they chose. Discuss with the class whether each fact is an important detail or a less important detail. Ask students to use these facts to write a two-sentence summary of the text. and share it with a neighbour. Walk around and listen so you can choose a few strong summaries to read aloud. Have students tell you why it's a strong summary. Hand out index cards, and have students write down one or two inference questions about the Columbia River. Each question should be on a separate index card with the answer written at the very bottom of the index card. Ask students to switch taking turns with a neighbour and asking and answering their questions. 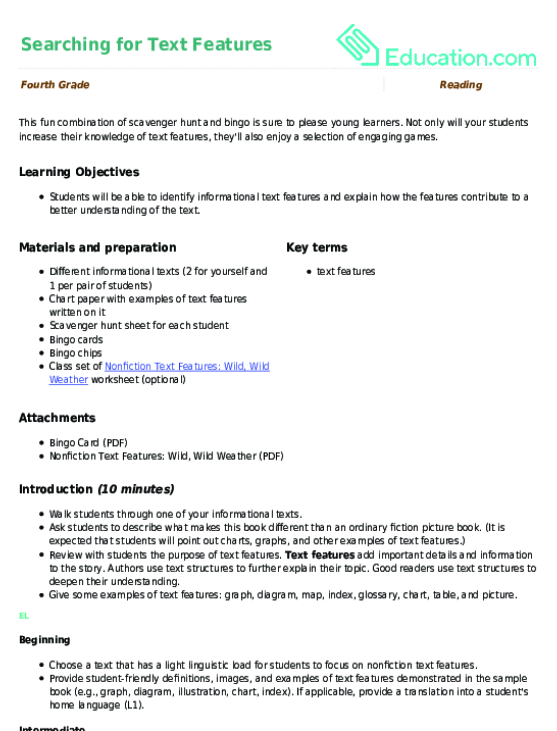 Hand out three worksheets to half of the students in your class: The Missouri River , The Rio Grande, and The Connecticut River. Hand out three different worksheets to the other half of your class: The Mississippi River, The Hudson River, and The Colorado River. Distribute three index cards to each student. Read the text about a river and choose one on which to focus. Find the river on the Map of U.S. Rivers worksheet and label it. Write a two-sentence summary of the text. Write three questions about the river—including at least one inference question—on separate index cards. Write the answer at the very bottom. Repeat these steps with another river. Answer any clarifying questions. Invite students to begin, and tell them that they have approximately 15 minutes. Gather students' together after most students have finished at least two rivers. Instruct students to find a partner who worked on three different rivers. Each student should teach/share about their river by pointing them out the rivers on the Map of U.S. Rivers worksheet and reading their summaries. Pull as small group and guide them through the assignment. Have students fill out the "Fact File" section at the bottom of the river worksheets instead of highlighting three important facts. Allow students to write fact-based sentences rather than a summary. Students may write one sentence instead of two. 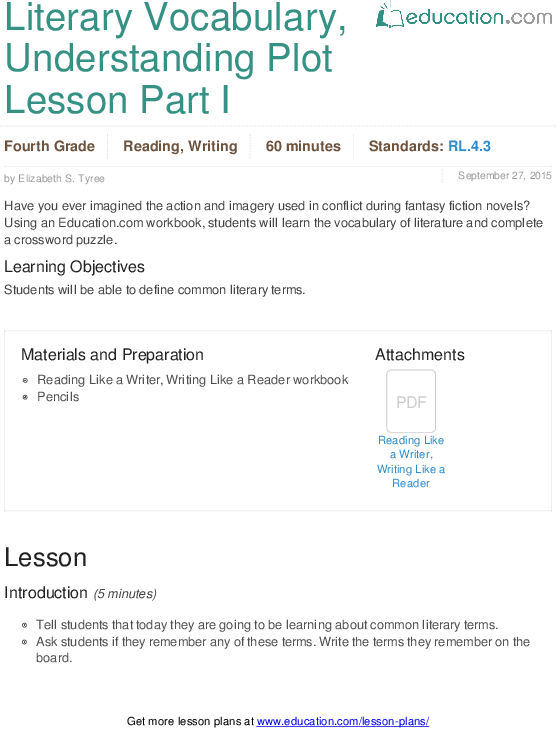 Challenge students to complete the assignment using two resources (e.g. the river worksheets and an atlas). Students can integrate two texts to determine the most important information about each river and provide a summary. As an exit ticket, project The Ohio River worksheet onto the board. Have students to take out their writing journal (or lined paper) and write a two-sentence summary of the second paragraph. Ask students to write one inference question based on this text. Collect and review for understanding. Tell students that it's time to play jeopardy. Collect all the index cards with questions. Divide students into teams of four or five, and give each group a whiteboard and marker. The teacher reads the question, and all teams have approximately 20–30 seconds to write the answer on the whiteboard. When the teacher calls time, every team holds up their whiteboard. Any team with the correct answer gets the points. 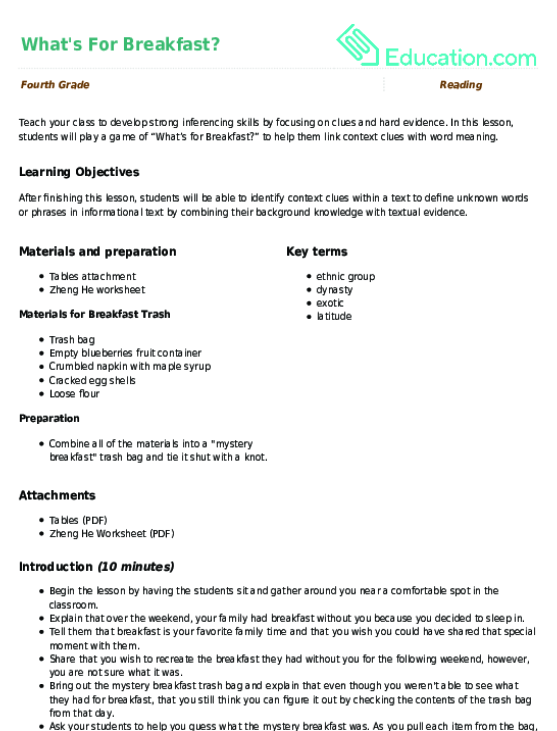 In this lesson, students will play a game of “What’s for Breakfast?” to help them link context clues with word meaning.